Good apartment's. The reception staff were very helpful. And the hotel was very clean all round. Only down side is the lack of back ground music & nothing happening in the pool. Felt like being in a mortuary. Best laugh I got in the mornings at the pool area the vultures were out before the sun beds parasols were released at 9am. Within 10 minutes they were all gone & no one at the pool. Reminds me oh Randal & hop kirk the man in the ( white suit) you could never c him/ them . Other than that would recommend. More parasols would b to everyone's advantage. We have been at Cristian Sur a lot of times. We really enjoy staying there. Of lot of reasons. For the frist the staff at Cristian Sur is nice and helpful for everything we want. The apartement is godd enough for us. We can really give our top rating for our standing at CS. We are vback 1t 19th December for seven new weeks. See you there??? The apartment was very clean and comfortable and looked like it had been refurbished. The pool area had ample sunbeds, was extremely clean and well maintained. I would highly recommend Cristian Sur to families and couples. Very smart, quiet and relaxing place but a little way out of the town and the beaches. The many stairs we had to climb to the apartment with the cases and kids was a bit much but only had to do it the once thank heavens. 2 nice pools but very cold and seemed to be a meeting point for residents, the cafe on site didn't serve much and was expensive. Rooms nice and clean on arrival, well equipped. We ate out most of the time mainly at a little place on the sea front called Amigos, run by a British family who are all friendly and the food is fantastic, especially the Fish and Chips, really old fashioned style and the only thing missing was the newspaper wrapping. They also had great entertainment on at night, a brilliant rock guitarist and singer called Simon May. It's a pity this seems to be the only live entertainment on the sea front. This Hotel is basic, very clean with friendly staff. The rooms are basic but spacious. The only downside for us was that we were allocated a ground floor room next to the main road .There was some traffic and Bar noise from the bars across the road but it was not a problem once you were anaesthetised by alcohol. Our patio area was fenced off from the road by plantation therefore we got very little sun on the patio. WE stayed in a one bed apartment, but booked for breakefasts. The breakfast was a buffet, which was excellent value for money. We also dined on quite a few evenings in the restaurant which was also excellent. The rooms are kept clean and tidy. Clean towels most days. All things in the room worked apart from the hair dryer. We had a road side view. This was near the restaurant, but the noise was not a problem. Pool was nice and kept clean, but we found it to be quite over crowded at times and not many beds available after 10am. All the staff were nice and friendly. Would go back myself and would recommend it to others. 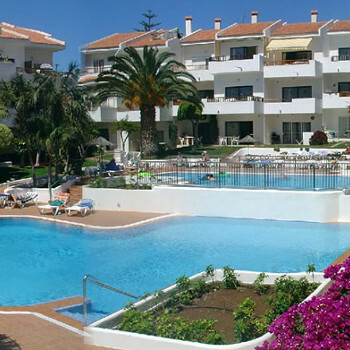 Stayed for 2 weeks at the Cristian Sur apartments in Los Cristianos and we had a great holiday. The complex was very clean, and staff worked hard to keep it that way. The rooms were clean although I must admit quite basic. Bed setee in the living room was not very sturdy and quite uncomfertable. The maids came in most days and cleaned, beds were changed twice per week with clean towels left most days. Did not have any problems with noise found the complex to be very quiet. The television is a bit of a con though, have to pay 20 euros per week for the use of the remote control otherwise no telly at all. The hotel staff were always more than helpful and always did their best to help. Los cristianos is a lovely town and plenty of bars and resturants which offer good cheap meals. Its about a 10 minute walk to the beach from the apartments, which we did most days and did'nt find too bad. There is the little beach by the harbour which we found to be a bit smelly, but if you go around the corner there is la vistas beach which is a lovely beach and where we spent most days soaking up the sun. We had a fab holiday, really relaxing and would defintly stay at the cristian sur again. We have stayed at this accommodation for the last 3 years and have always been highly satisfied with it until this year!!! Apartments are not as clean as they were previously, I think all the rooms must be circular as none of the corners were ever cleaned!!! The bedding was only changed once in two weeks and that was the day before we came home. The noise levels at night are horrendous, and that was from the other guests, slamming the doors and running riot around the complex. It was very difficult to get any sleep before around 2.30am.